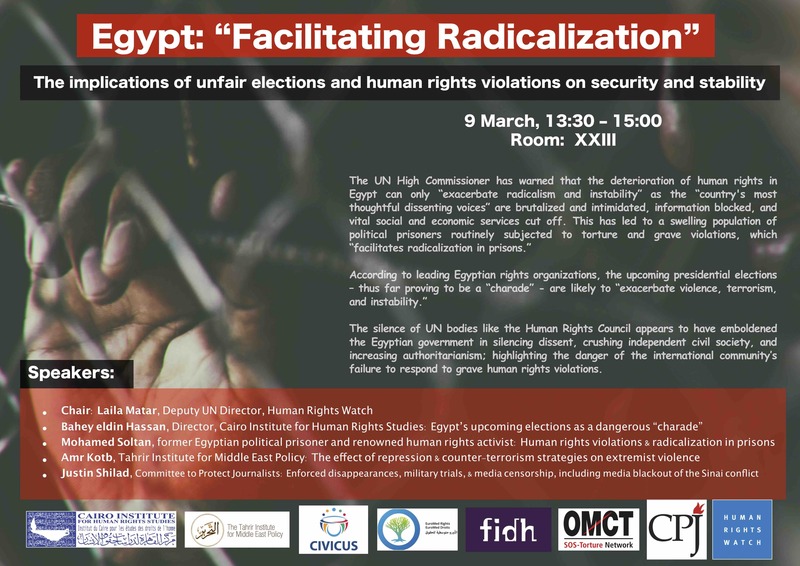 At the 37th session of the United Nations (UN) Human Rights Council (the Council), held between 26 of February and 23 March 2018, the Cairo Institute Human Rights Studies (CIHRS)and its partners from throughout the Middle East and North African (MENA)region called on UN member states to take stronger action to ensure accountability for grave and widespread violations of human rights, including war crimes and crimes against humanity, taking place in Syria, Yemen, Libya, Palestine, and Egypt. The Council held an “Urgent Debate” on the deteriorating situation in Eastern Ghouta, resulting in a resolution urging the Commission of Inquiry on Syria to investigate the grave and widespread human rights violations taking place there. Speaking before the Council, CIHRS welcomed this development but reiterated the need for the Council to move beyond condemnation and take concrete steps to strengthen legal accountability for those committing international crimes in Syria, including by establishing a detailed study on how states can expand and bolster the use of national and universal jurisdiction to investigate and prosecute alleged crimes committed in Syria. 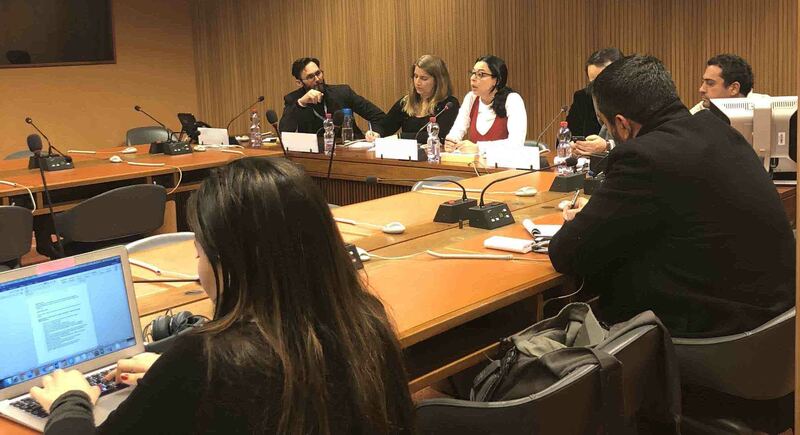 In follow-up to a call by CIHRS and its partners for victims to be given a voice within the Council proceedings, a second High-Level Panel featuring testimony by Syrians on crimes committed in the country was held on the 13th March, this time focusing on the “Human Rights of Children” in Syria. The first such panel, held a year earlier, focused on violations against those in detention. CIHRS welcomes the emergency debate concerning the deteriorating situation in Eastern Ghouta that occurred this session. Almost 674 civilians have been killed in this area of the suburbs of Damascus in less than 2 weeks from indiscriminate attacks by the Syrian regime and its allies. The 400,000 residents of Eastern Ghouta have been besieged, denied basic humanitarian access, and constantly targeted by heavy shillings and indiscriminate attacks. In addition, evidence shows that chemical and other prohibited weapons have been used in Eastern Ghouta and other areas in Syria such as in the suburbs of Idlib. Syrian government forces and its allies are so far unwilling to abide by their legal obligations under international humanitarian law and international human rights law, as well as all relevant resolutions and decisions of the UN. Recent events are further evidence that there can be no peace or end to the bloodshed and crimes in Syria without ending impunity. Peace efforts will almost certainly yield no tangible or sustainable results while the parties sitting at the table enjoy impunity for their unrelenting targeting of innocent lives. CIHRS welcomes the latest Council resolution's request for the CoI to investigate events taking place in Ghouta. However, the time has long passed for investigations and accountability to take centre stage at this body. The recurrent targeting of civilians, civilian infrastructure, including by using chemical and other prohibited weapons by the Syrian government is undeniable. There can be no more delay in taking action to bring the perpetrators to justice. CIHRS welcomes the French initiative backed by thirty States to create an information-sharing network to bring perpetrators of chemical weapon attacks to justice. CIHRS further calls on France and supporting States to rally support around this initiative at this Council and the UN General Assembly, and work to bring the Security Council paralysis on accountability for Syrian crimes to an end. Once again, the international community is called upon to uphold its responsibility and meaningfully cooperate to bring an end to the horrors in Syria. We call upon the Council to create a specialized resolution on accountability for Syria that provides recommendations for States to increase and improve the use of national justice systems for investigating and prosecuting alleged crimes in Syria based on universal jurisdiction and other relevant domestic legal standards. Such a mechanism would complement and assist the International Independent Investigative Mechanism on Syria created by the General Assembly. We would also like to ask the Commission of Inquiry on what actions they recommend this Council to take in order to further support accountability for crimes committed in Syria? The human rights situation in Egypt continues to deteriorate with no end in sight. Fourteen regional and international organizations have said that the upcoming elections in March are neither free nor fair, and leading Egyptian human rights organizations recently warned the elections have become a dangerous "charade" that is likely to "exacerbate violence, terrorism and instability" in the country. Egyptian authorities increasingly employ brutally repressive tactics to silence legitimate dissent, from passing legislation effectively banning independent NGOs and tight censorship of media outlets to enforced disappearances, systematic torture, large-scale arbitrary detention for long periods, unlawful killings and accelerated use of the death penalty. The judiciary has largely failed to hold to account those responsible for violations of international and national lawand, in many cases, the courts have served as an instrument of repression for the authorities. The UN High Commissioner for Human Rights has repeatedly warned that “brutality and intimidation of the country's most thoughtful dissenting voices, the cutting off of the vital social and economic services provided by NGOs, and blocking information can only exacerbate radicalism and instability” in the country. Despite this dire assessment by UN officials and experts, we have witnessed a profound absence of leadership to address the situation in Egypt at this Council. The silence of this body has become increasingly difficult to justify as the Egyptian government steps up its campaign to criminalize peaceful dissent, crush independent journalism,and eradicate independent civil society. This silence has also perpetuated impunity and provided reassurance to Egypt’s security forces that there will be no consequences for committing human rights violations. Will this Council continue to standby as the survival of Egyptian independent civil society and the possibility for future democratic reform in the country hangs in the balance? During the session a growing diversity of states condemned ongoing human rights violations within Egypt. For the first time the Foreign Minister of Iceland, during the opening ceremony of the Council, expressed deep concern about the situation in Egypt. Australia, also for the first time, condemned the grave human rights violations occurring in the country. 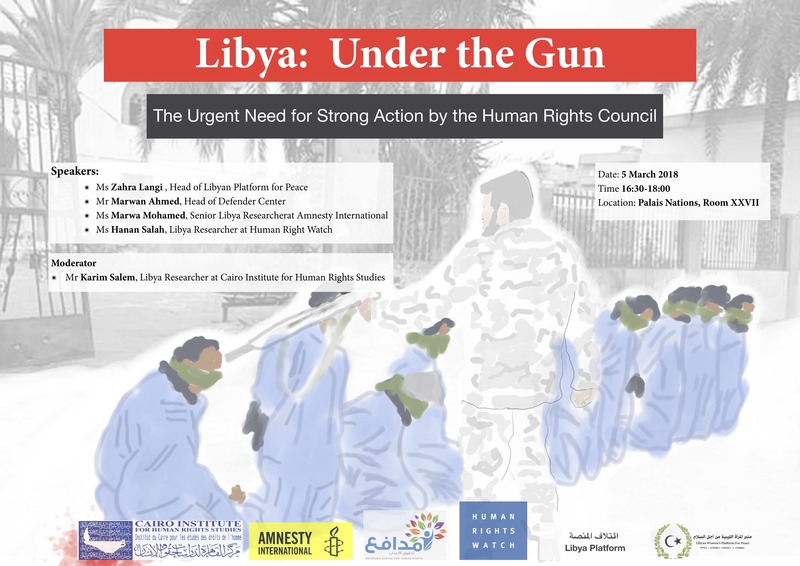 Grave and widespread human rights violations in Libya, including credible evidence of the establishment of slave markets, animated efforts by CIHRS and its Libyan partners to establish a Commission of Inquiry or similar accountability mechanism on Libya at the Council. The UN High Commissioner of Human Rights, during his annual update to the Council, described the situation in Libya as one of complete lawlessness in which impunity fuels serious crimes. Given the serious human rights violations ongoing in Libya at the moment, it is of great concern that the current resolution on Libya put before this Council by the African Group looks like it will once again fail to dedicate significant resources to address the wide range of serious human rights violations or create a fully fledged international investigative mechanism to help overcome impunity and deter violations, including alleged war crimes and crimes against humanity. As such, the resolution on Libya this year once again appears to have prioritized political considerations over the need to protect victims. While we recognize that the ICC has a significant role to ensure accountability in Libya, there is a serious gap in reporting on the human rights situation in Libya that is necessary as a prerequisite to a successful political agreement therein. Such impunity is fueling grave and widespread human rights violations; from extrajudicial killings and attacks on civilians, to widespread torture in detention and open slave markets. Migrants and refugees are being subjected to particularly horrific conditions and atrocious human rights abuses leading to the death of more than 10,000 individuals over the last three years. Impunity in Libya has also emboldened armed extremist groups linked to Al-Qaeda, the Salafists and ISIS. The status quo, which the current resolution on Libya represents, is no longer acceptable. Victims of human rights abuses in Libya, citizens of Libya and citizens of other African countries, deserve better. Unfortunately, the resolution on Libya adopted by the Council failed to establish a strong accountability mechanism or ensure an increase in the resources required to ensure stronger engagement on Libya by the Council and its special procedures. Critically, efforts by CIHRS, its partners and others did ensure future reporting on Libya to the Council by the UN Office of the High Commission for Human Rights with a focus on individual criminal responsibility for crimes committed in the country. As part of its efforts to increase visibility on the situation in Libya, CIHRS organized an event at the UN entitled “Libya under the Gun: The Urgent Need for Strong Action by the Human Rights Council.” The event was carried out in cooperation with 15 Libyan organizations as part of the “Libyan Platform” as well as Amnesty International, and Human Rights Watch. During the event, and for the first time at the UN, a documentary film was screened on the persecution and internal displacement of the Tawergha people in Libya. The film was created by a local Libyan activist and produced with the assistance of CIHRS as part of larger efforts to empower local activists through multi-media training. 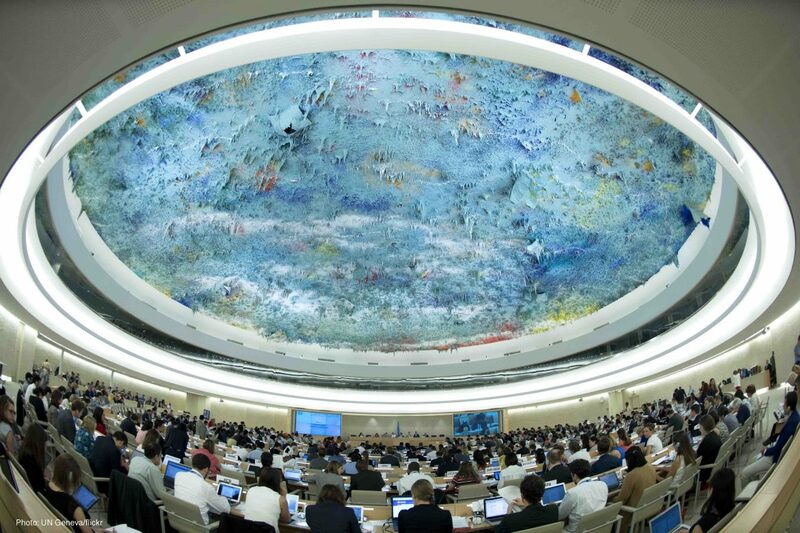 During HRC 37, CIHRS continued to play a central role in efforts to ensure the creation and implementation of a Database on Businesses engaging in illegal cooperation with Israeli settlements (the database) within the Occupied Palestinian Territory (OPT). A report by the OHCHR concerning ongoing efforts to produce the database was issued in January 2018. However, largely as a result of strong political pressure by the US, the EU and others to marginalize and weaken this mechanism, there was no mention of this report or of concrete follow-up on the database in the resolutions dealing with Palestine during the session. Moreover, European States and the United States (US) continued a long-standing position of non-engagement in Council debates concerning the human rights situation in the OPT. The US and Israel also increased their efforts both before and during the session to do away with the Council’s permanent agenda item dealing with this situation. This is a highly worrying development that, if successful, could greatly weaken the Council’s ability to appropriate address the worsening crises caused by the prolonged occupation of Palestine and the grave human rights violations committed by Israeli military forces. We welcome the report on the UN Database of businesses engaged with Israeli settlements released last month by the Office of the High Commissioner. The Database is a much-needed regulatory initiative for business conduct in the occupied Palestinian territory, where hundreds of Israeli and foreign businesses participate in or contribute to violations of international law. It is essential that states support this endeavor, and constructively engage in its establishment and review. The Database is an innovative and cooperative tool that can be developed to assist in ending business dealings that contradict international legal standards. It constitutes an important development in more general efforts to ensure responsible business conduct in high-risk environments where systemic and widespread human rights violations are being committed. The Database should be a mechanism that engages states and businesses as a tool for transparency and compliance control. To that effect, the OHCHR should ensure that data pertaining to the continued involvement of business companies in the occupied Palestinian territory is publicly transmitted to the HRC as required by resolution 31/36. An effective Database would also provide hope to the Palestinian people that the international community is committed to end half a century of military occupation that has acquired aspects of both colonialism and apartheid, and which continues to deprive the Palestinian people of their most basic rights. CIHRS and its partners spoke before the Council to urge members States to use the report on the UN Database as a useful first step for ensuring that companies in their jurisdiction are conducting business in a manner that conforms to international legal standards within the OPT. While the US and many European states failed to acknowledge the important work of the OHCHR in the development of the UN Database, other states such as Ecuador, Namibia, and Tunisia strongly welcomed the Database. 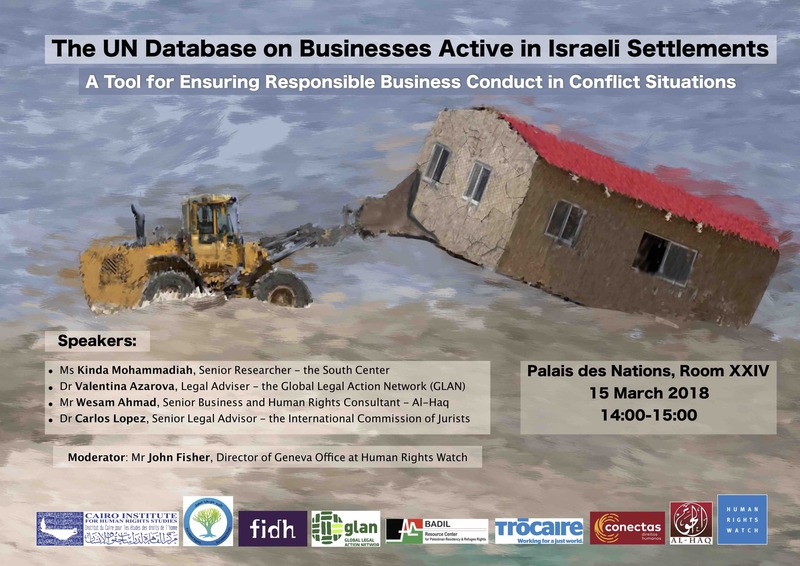 CIHRS also organized an event on Palestine that brought together local and international rights organizations, as well as legal experts, to discuss the importance of the database for international efforts to ensure responsible business activity. The event, entitled "The UN Database on Businesses Active in Israeli Settlements: A Tool for Ensuring Responsible Business Conduct in Conflict Situations" examined the mandate, function and potential utility of the Database as an innovative tool for transparency and compliance control with the existing obligations and responsibilities of states and businesses under international law. CIHRS, in cooperation with a leading Yemen human rights organization Mwatana for Human Rights, also intervened on Yemen during the session. Speaking before the Council, CIHRS and Mwatana welcomed the establishment of the Group of Eminent Experts on Yemen and urged them to closely monitor and report on the situation in Yemen with a view towards individual criminal responsibility for all parties to the conflict, and to examine third party culpability of ongoing violations of international law. One of the most prominent of these violations is the ongoing sale of military equipment and weapons, especially by the US, UK and France, to governments of the Saudi-led coalition forces despite strong evidence of war crimes and crimes against humanity being committed in Yemen by members of this coalition. This statement is delivered on behalf of Cairo Institute and our Yemeni partner organization Mwatana for Human Rights. We would like to congratulate the Council and the Office of the High Commissioner on the establishment of the Group of Eminent Experts on Yemen. The people of Yemen are currently confronted by famine, outbreaks of cholera and the targeting of civilians and civilian infrastructure by all parties to the conflict. Violations and abuses of international humanitarian and human rights law, including the targeting or blocking of humanitarian aid, have resulted in the “largest man-made humanitarian catastrophe” in the world. The establishment of the Group of Experts last September represents a necessary step towards ensuring accountability for grave violations of international law in Yemen. It also demonstrates what is possible when the welfare of civilians guides action at this Council. We urge the Group of Eminent Experts to closely monitor and report on the situation in Yemen with a view towards individual criminal responsibility for all parties to the conflict, and to examine third party culpability of ongoing violations of international law. Countries such as the US, the UK and France remain the largest exporters of military equipment and weapons to the Saudi-led coalition forces that have been implicated in alleged war crimes. Earlier this year, Mwatana documented an attack by the coalition on Al-Shumiyah village where three innocent civilians were killed, including two girls: 8-year-old Hanaa’ and 10-year-old Rajaa’. We would like to ask the speaker to comment on whether arms trade to coalition forces in the Yemen conflict could undermine attempts by the Council and the Group of Eminent Experts to ensure an end to violations of international law in the country. CIHRS also joined a group of international and regional organisations in an Oral intervention, commenting on a draft resolution by the Council regarding the strategies adopted by countries in the War on Drugs. We would like to call your attention to the issue of the so-called “war on drugs” and drug-related policies which have led to a range of human rights violations worldwide. We acknowledge the progress made by the Human Rights Council and the Special Procedures in making clear the relationship between anti-drug policies and human rights. However, this issue has the potential to be further addressed by the Human Rights Systems. On Friday, this Council will consider a new resolution on this matter. It is a great chance for this body to contribute significantly to the evaluation of the current drug control regime and to address the constant calls of further involvement and coherence between UN bodies with the ongoing processes at the Commission of Narcotic Drugs and the revision of the 2009 Political Declaration and Plan of Action as well as the outcomes of the 2016 UNGASS on the world drug problem. The resolution in question requests the OHCHR to prepare a report on the application of human rights indicators to strengthen existing data collection and analysis tools in drug statistics. This will provide different stakeholders with improved understanding and data in order to improve policies concerning human rights issues. It is an important opportunity to to increase the Human Rights Council’s impact and operationalise human rights on the ground. We call on States to support this resolution and to constantly debate this pressing issue at this Council.